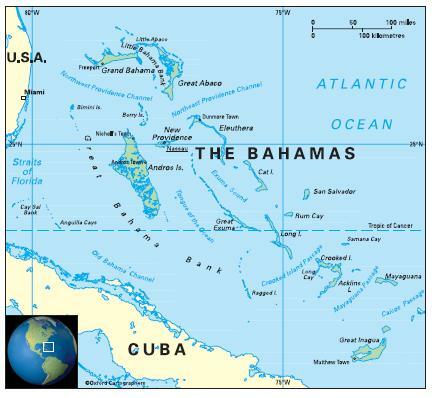 The Bahamas is an archipelagic nation comprising 700 islands and cays scattered over 100,000 square miles of water. Although our population of approximately 350,000 is dispersed over many islands, the Government is resolute in its commitment to providing access to quality and equitable education for all of its citizens. Additionally, significant efforts are being made to create an educational system that is technologically sound, competitive and which develops the strength of each child, whether academic or otherwise. The Government is firm in its belief that access to quality education will enable its citizens to contribute to the further development of The Bahamas. The Ministry of Education, Science and Technology has developed a multifaceted approach to ensuring that our education system serves the needs of our citizens and our nation. Recognising the urgent demand for a highly skilled workforce we have placed greater emphasis on training in technology and skills development. Four million dollars have been invested in Information Communication Technology (ICT) within our public schools over the past year to prepare students to function in a technology driven world. The first of several Career Academies has been successfully piloted in Construction Trades at one of our high schools. The goal is to open other academies to cater to students’ interests in Business Studies and Hospitality Management. These academies will operate simultaneously with magnet programmes to allow students to acquire skills for the job market or prepare them for college in areas such as pre-engineering, marine biology and maritime science. Another major thrust in Bahamian education is the continued provision of Pre-School Education, hence new pre-school units have been added and existing units expanded to serve our growing population. It is anticipated that this step will provide a solid foundation for our children’s education. The Government is also determined to create more opportunities for children with special needs to be educated and trained so that they can have greater independence and enjoy a basic right afforded them by law. This has led to the integration of special needs units in our primary schools, and prevocational units for special needs students into high schools. While we address the needs of our students, we are also focused on developing quality teachers for our educational system. This has resulted in the establishment of a soon to be opened In-Service Professional Development Institute to provide training for teachers and other education personnel. Some of the objectives of the institute are: to increase effectiveness and efficiency within the Ministry; to create in The Bahamas a cadre of education sector workers who are better prepared with the requisite skills to lead and to serve; to improve the delivery of services to the public, particularly to students; and to align policy with practices. Underpinning these plans will be exposure for all of our citizens to character-building, civic education and appreciation of our history. We firmly believe that with parental support and all other stakeholder involvement, we can affirm our nation’s motto – “Forward, Upward, Onward Together”. There are several initiatives to improve the academic curriculum in the public school system, with a particular emphasis on improving performance in mathematics at The Bahamas Junior Certificate and General Certificate of Secondary Education levels. Educators, including the Bahamas Association of Mathematics Educators, have underlined the importance of mathematics education in many academic disciplines and employment sectors. There are 12 years of compulsory education starting at the age of five. Primary school comprises six years and secondary six. Some 90 per cent of pupils complete primary school (2009). The school year starts in September. The College of The Bahamas, the country’s leading higher education institution, provides a diverse curriculum with courses leading to bachelor’s degree level. The Eugene Dupuch Law School opened in September 1998, as a part of the University of the West Indies. It offers the same curriculum as the Manley and Wooding Law Schools. Students are eligible for places at the University of the West Indies, which also has an extra-mural department in Nassau and campuses in Barbados, Jamaica, and Trinidad and Tobago. Other government-assisted higher technical and professional schools and private colleges provide clerical, secretarial, accounting and computer training.